You know I’m the least pessimistic person in the world, but honestly, 2014 was pretty meh. It started with a devastating loss, limped through Tony Barbee’s final basketball season, continued through Sunny Golloway’s rebuilding year in baseball, experienced a major loss to the Auburn Family, then an 8-4 football season that wasn’t terrible, but wasn’t what it could’ve been. It wasn’t all bad, Auburn got Bruce Pearl, there were some big wins in football, and some other pretty exciting moments that I tried to capture in this web space. In terms of the Blogle Enterprises, it was just meh as well. Two boys under the age of 6 with a real job that is as big boy as I’ve ever had definitely put a strain on this hobby. And as I’ve said before, this site goes as the football team goes. So while Auburn won 2/3 of the football games as they did the year before, the Blogle received around 2/3 of the views as it did the year before. That’s fine, though. Twitter followers, which is the lifeline of this whole thing, went up over 11,000. So some of you still love me. Alright, enough negativity. This thing is still way bigger than I thought it ever would be, and I’ve got ideas for 2015, man. 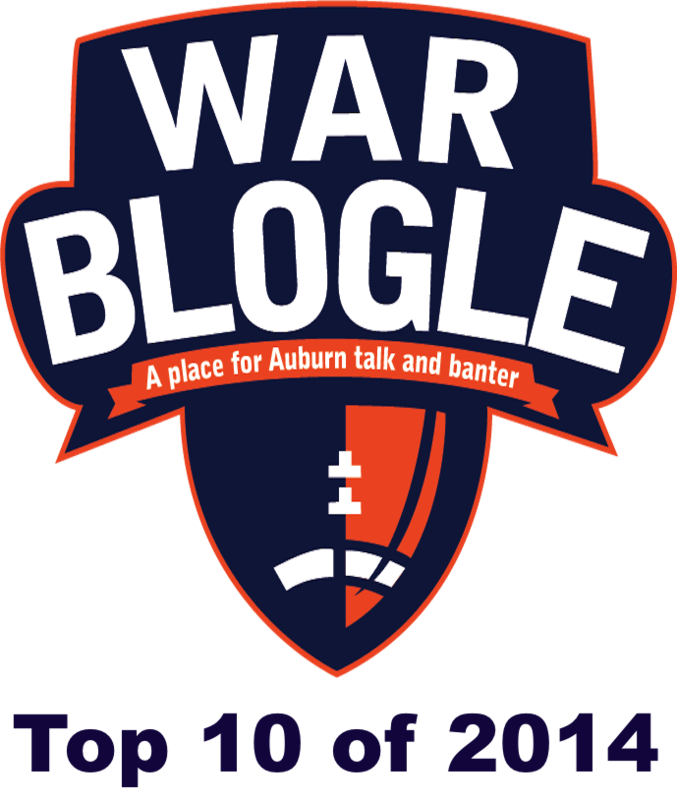 But before we move forward, let’s take a look back at the 10 WarBlogle.com posts that piqued your interest the most. 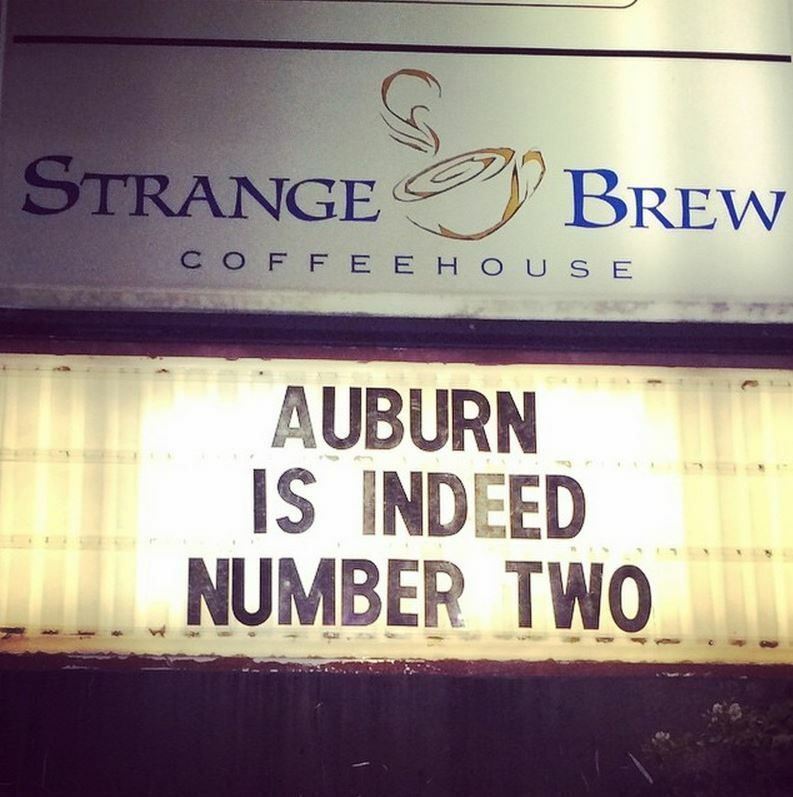 The Starkville based coffee shop, Strange Brew, has been known to sling a little smack towards Auburn each time the better team comes into town. In 2010, they went with the typical Cam Newton jokes. In 2012, they went terrible with some Chizik and ginger jokes. This year, they’ve gone straight grade school and/or Terry Henley on us. Before you start, don’t. 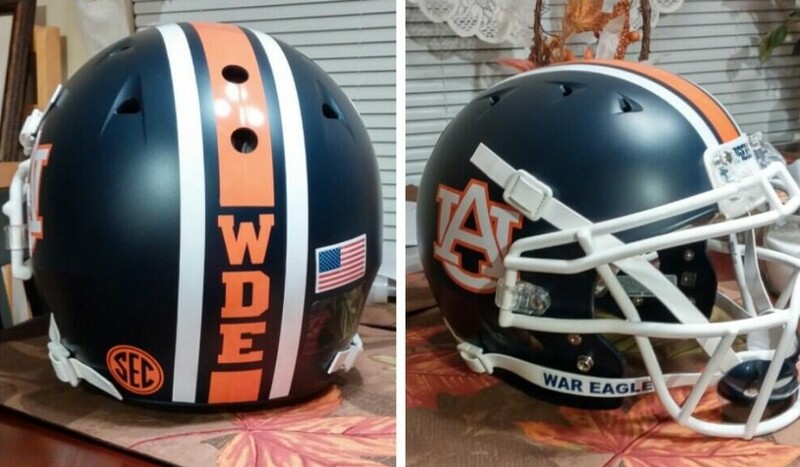 Auburn is not going to wear these (I think) anytime soon. I am not saying Auburn should wear these. I think they look cool. That’s all. Alright, now that I’ve handled the faux-traditionalists (what you think has always been has not always been), let’s take a look at two Auburn helmet concepts constructed by @mbowman0842. Bowman says he does these in his free time as a hobby. For the two below, he bought the plain white and plain blue helmets off eBay, sprayed matte finish on them, updated the facemasks, and applied the stickers and striping. He says it takes him around two hours for one helmet. Prior to last week’s San Jose State game, the 2004 undefeated Auburn Tigers were honored on the field with the name of each player in attendance being called out by stadium announcer Ric Smith. As the final player was called, there stood one man left to be recognized. That man was smiling ear to ear. That man was Tommy Tuberville. 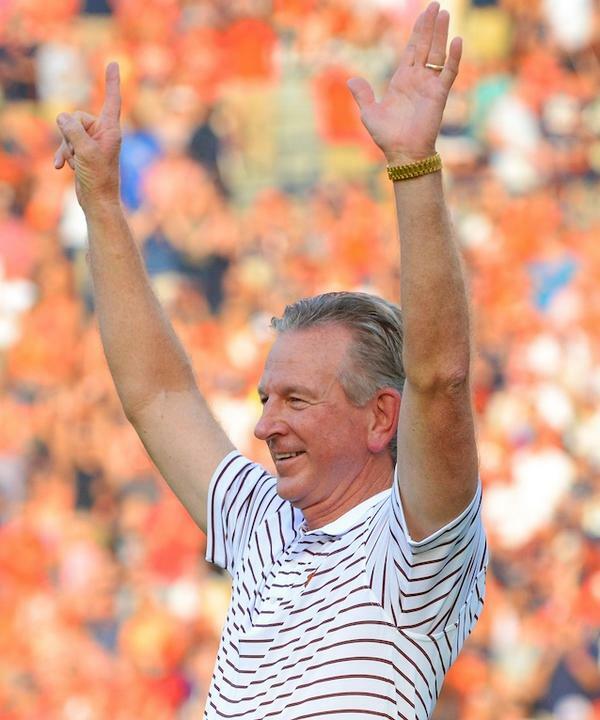 As his name was called, Tuberville lifted his hands. As he lifted his left hand, he extended five fingers. As he lifted his right hand, he extended one finger. They equaled six. Six wins. Six straight wins over Alabama from 2002-2007. Yesterday, one of the greatest annual events in sports comedy happened. I’m of course talking about “The Running of the Gumps” at Alabama’s Fan Day. It’s where people line up for days to get the first shot to do their best 109-yard dash down the field at Bryant-Denny to get an autograph from their personal Lord and Savior Nick Saban. Wait, did I say 109 yards? Yes, I did, and so does Rod Bramblett. Just picture the first guy as Chris Davis and the slow white ones behind him as Bama fans trying to make it stop. It makes it even funnier. Cam Newton is back in class this semester, and just like last year, he received a singing telegram from Auburn’s Wesley Foundation. This year, he was a little less shy and even played along. Maybe he’s a One Direction fan. He even gave one of the three roses he received to his professor. Such a sweetie. It’s about that time, and this simple, yet very effective hype video for the 2014 football season, from a YouTube account called Auburn Memories, will get your juice flowing just enough to get ready to start getting ready. It’s simply titled “The Wait” because that’s about all we can do right now, other than look over socialist watch lists that give everybody a preseason trophy. For the fifth straight year, the ‘Blogle will be your one-stop shop for all things National Signing Day. While other sites work to be the best at giving you their coverage, I will be giving the best of all the coverage out there. In the age of Twitter, every announcement is at your fingertips. But sometimes your fingertips have to be elsewhere, so why not just stay here and let me be obsessive and incessant for you? I will be updating this post multiple times throughout the day with every announcement, rumor, and surprise (I think there will be a few), so stay locked in to the ‘Blogle. I’ve got you covered. 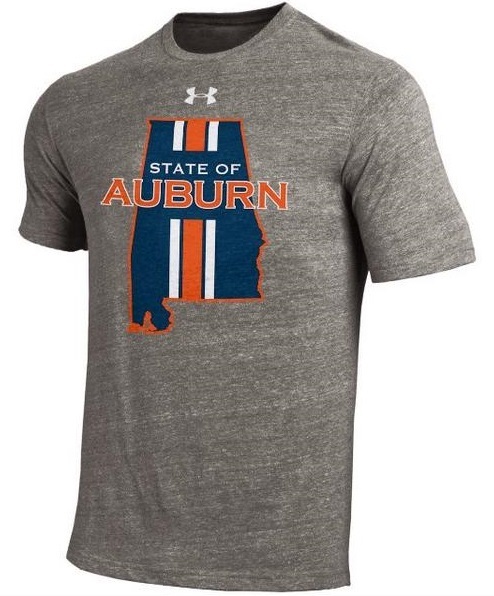 Under Armour provides Auburn athletes with shirts that are mostly unavailable to the public. As Sammie Coates left the Auburn Athletic Complex on Friday, he was spotted wearing one of those shirts. A picture of that shirt was tweeted and #AuburnTwitter went crazy. A few hours later, I was told the decision was made to take this shirts public. Today, J&M Bookstore announced that they are going to sell these magical shirts to the public. See, the internet is good for something. Senior defensive lineman Nosa Eguae (#94), who played his final game as an Auburn Tiger in the 34-31 BCS Championship loss to Florida State, has been one of the leaders of the Auburn football program since he won the 2010 BCS Championship as a freshman. Although he played his final game in an Auburn uniform on Monday night, he is forever part of the Auburn Family. Below is his message to the Auburn Family. This is Auburn. Watch this now because it’s likely to be whacked by the coaching staff soon. Update: it was taken down about 2 minutes after this was originally posted. So darn, BUT WAIT, ya boy Blogle copped that piece in case that happened. Duke Williams has posted video of him making some sort of backwards-spinning, one-handed catch from practice footage. Enjoy it until I’m asked to take it down. Thank you all for another year of blogling. We’ll make 2015 the best ever. I promise.